If you have an existing heater that no longer operates efficiently or doesn’t fire at all we can diagnose and repair your pool/spa gas heater. We are factory trained and have years of experience with Swimming Pool & Spa Heater Repair & Replacement (natural gas and propane) on most brands of heaters including Teledyne LAARS, Ray Pak, Jandy, Hayward, Purex, Pentair and Sta-Rite. Contact us to set up a appointment to troubleshoot your heater. Swimming Pool Heaters are effective for heating pools but are primarily used for quick temperature rise in an attached spa. Whatever your intentions, size is critical !! Heater sizes are measured in BTU’s (British Thermal Units). The more BTU’s, the more heat generated and the quicker the heat rise. We will help you determine which heater has the most value for your application and will install your heater with proper sediment traps, plumbing, electrical grounding and bonding. Installing a pool heater can be tricky. To make sure you get the best installation possible, contact Mike the Poolman. 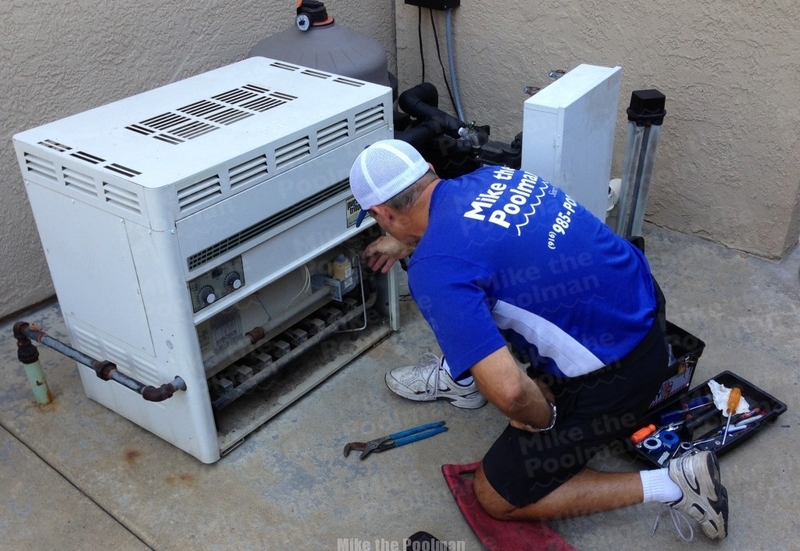 We will inspect your pool to determine what size pool heater you need and how you should power your heater. If you get a pool heater too small for your pool, you won’t feel the effects and it will ultimately be rendered useless. On the other hand, if you get a pool heater too big, you will be paying for a heating capacity you will never reach or use. Pool pump sizing is also critical for proper heater performance.